South Africa will be one of the homes of the Square Kilometer Array Project, an international effort to build the world’s largest radio telescope. With the goal of eventually constructing thousands of dishes in Africa and a million antennae in Australia, scientists hope to solve some of the biggest mysteries in astronomy, such as how the first stars and black holes were formed, the nature of dark energy, and whether life exists beyond Earth. For journalist Sibusiso Biyela, this project presents another exciting opportunity: the chance to communicate science in South Africa’s indigenous languages—starting with his mother tongue, Zulu. Growing up in Esikhawini, a town located in the KwaZulu-Natal province on the east coast of South Africa, the first language Biyela learned was Zulu (also known as isiZulu in South Africa) the most common mother tongue in the country. But the scientific content he consumed as a child—movies, cartoons and documentaries—was in English. “All the science I’ve been exposed to has been exclusively in English because of the lack of other options,” Biyela explains. Biyela was still learning English when he started watching science-themed television, so in those early days, he mostly enjoyed the interesting visuals that those shows provided. As he became more proficient in the language, he also understood more of the underlying concepts—and grew increasingly fascinated with them. But because the adults around him did not discuss science much, he wasn’t sure how long his own curiosity would last. “It felt like it was one of those things that I would grow out of, like watching cartoons or playing outside,” he says. As he got older, Biyela realized one of the key reasons his parents and other adults in his community didn’t talk much about science: Having grown up in South Africa during apartheid, the period of institutionalized racial segregation between 1948 and the early 1990s, they were taught that science was only meant for those who were white. During that time, black South Africans were forced to live in designated areas, use separate public facilities, and go to different schools than white South Africans. “They were basically taught that science is not for you, you have no business learning science,” Biyela says. The apartheid regime is over in South Africa, but even today, remnants of its racist policies remain. 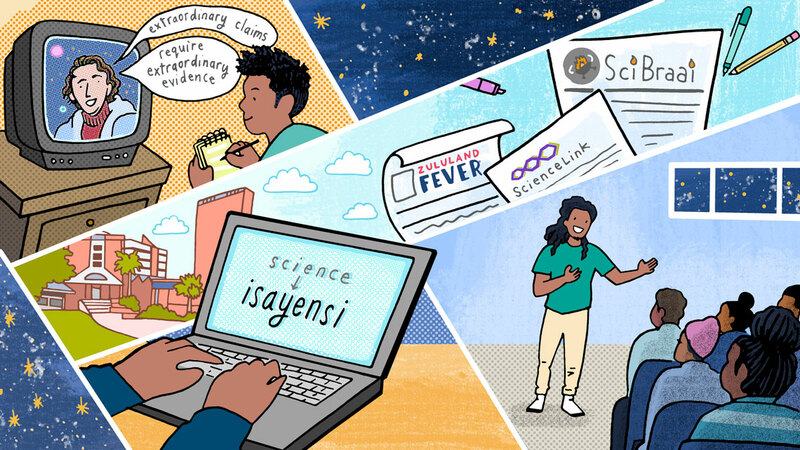 Although there are 11 official languages in South Africa, science is primarily conducted and communicated in the two that stem from the country’s colonial past: English and Afrikaans. Biyela wants to change that. Over the last few years, he has started writing articles about science in Zulu as a way to bring science back into the country’s indigenous-language-speaking communities. Biyela notes that the reason he wants to communicate science in his mother tongue is not because the people he hopes to reach are not capable of speaking English. “The issue is when scientists or science enthusiasts like myself are with friends or at home, where we talk about everything in our native tongue,” he explains. “As soon as we switch to a topic of science, then you have to switch the language. Biyela followed his passion for science past high school by enrolling in a chemistry and physics program at the University of Zululand in Richards Bay. But it didn’t take too long for him to realize that he did not want to become a scientist. “I was passing all my courses, but it just wasn’t for me,” Biyela says. Scientific research may not have been his calling, but Biyela loved writing up experiments. “My best times in my university chemistry class were writing practical reports and doing research assignments,” he recalls. So when Desiree Erasmus, the editor at Zululand Fever, a now-defunct local English-language newspaper in Richards Bay, asked him to write a science column, Biyela jumped at the opportunity. This gig jump-started Biyela’s writing career. Zululand Fever eventually hired him on as a journalist, and his opinion column earned him the Media Development and Diversity Agency (MDDA)-Sanlam local media award for “Columnist of the Year” in 2014. Biyela is now working at ScienceLink, a science communication company in Johannesburg. At the same time, he’s contributing to the non-profit website SciBraai, where he writes in both English and Zulu. “He was on the pioneering end of communicating in Zulu on online platforms,” says Anina Mumm, the co-founder of both ScienceLink and SciBraai. SciBraai was created with the goal of getting people to insert science into their day-to-day discussions. “South Africans barbeque, or ‘braai,’ a lot, and it gets people around the grill to talk about all sorts of things,” Biyela explains. I want to use the excitement for the project that’s being built to explain a lot of what’s happening in space. Currently Biyela is hoping to use the public interest surrounding the Square Kilometer Array Project as a chance to communicate science. The latest media buzz around the effort came last July, when South African officials inaugurated MeerKAT—a 64-dish precursor telescope that will eventually become part of the SKA. “I want to use the excitement for the project that’s being built to explain a lot of what’s happening in space,” he says. Mandi Smallhorne, a freelance science writer and the current president of the South African Science Journalists’ Association, notes that through this task, Biyela is shaping the way that people who speak languages like Zulu will think about science.